When I first started working as a Graphic Designer for Bank One, in 1992, our department floor in Bank One Center (now Chase Tower) looked down on a building that I found fascinating. It was an old Art Deco building, which had the look of a building in a Batman movie, all weird angles, stained, and abandoned. Nobody seemed to know anything about it, so I started asking around. 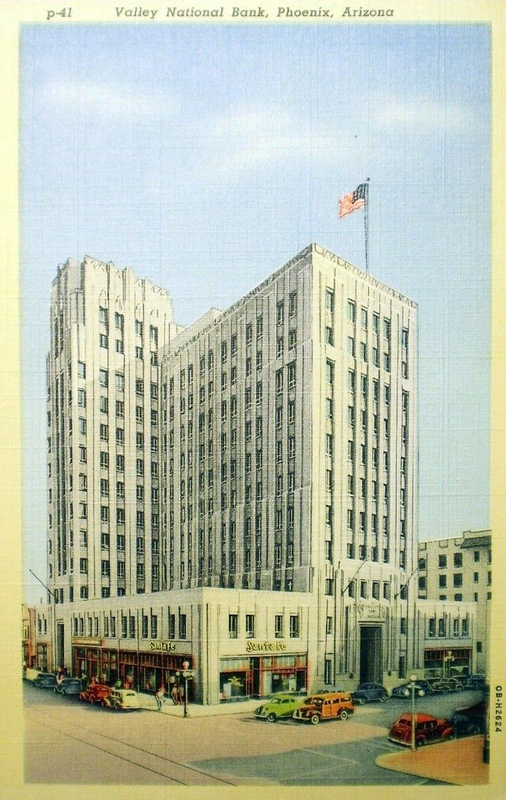 As of this writing, this building, originally called The Professional Building, is being restored as a Hilton Hotel. And if you're wondering why Valley National Bank abandoned it, and turned its back on it so long ago, you just need to look at their slogan, "Progressing with Arizona". When this building was new, in 1931, people were more than just a bit suspicious of banks. If you know your history, you know that the 1929 crash on Wall Street closed a lot of banks, and people were more inclined to keep their money safe under the bed than in a bank. So the first thing banks needed to do was to show strength and stability. When the Professional Building was new, it did just that. But the next step was even more important to the building of Arizona, branches. 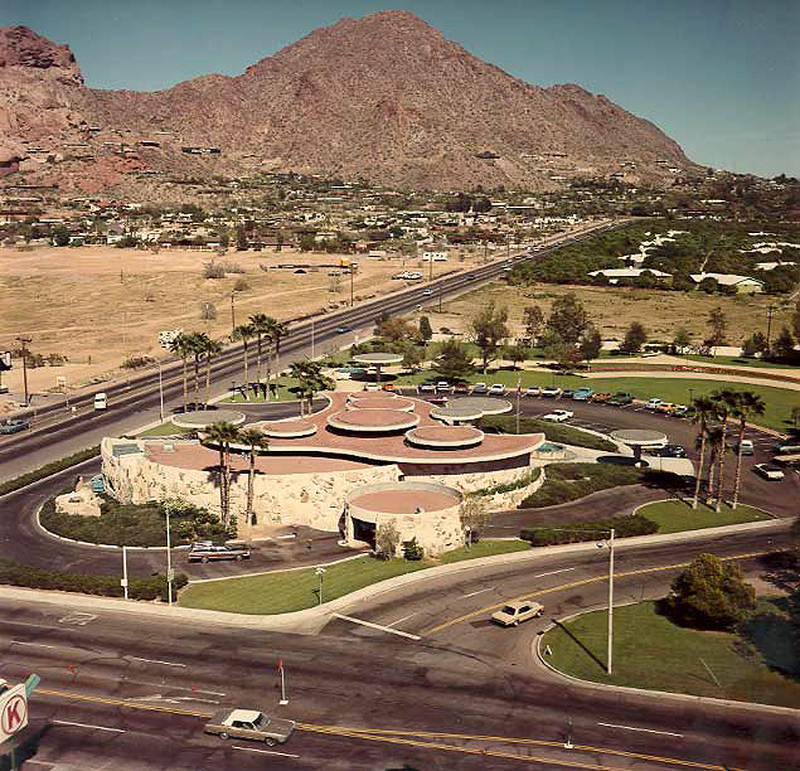 Valley Bank branch in the 1960s, 44th Street and Camelback Road. Now a Chase branch. Although we take it for granted now, before the 1940s, branch managers didn't have much authority to approve loans. Valley National Bank changed that. By the 1950s, customers could walk into any branch, anywhere in Arizona, and get a loan. They didn't need to go downtown. And so, through the 1950s and 60s, the emphasis was on creating branches that didn't seem as if they were "backwater". 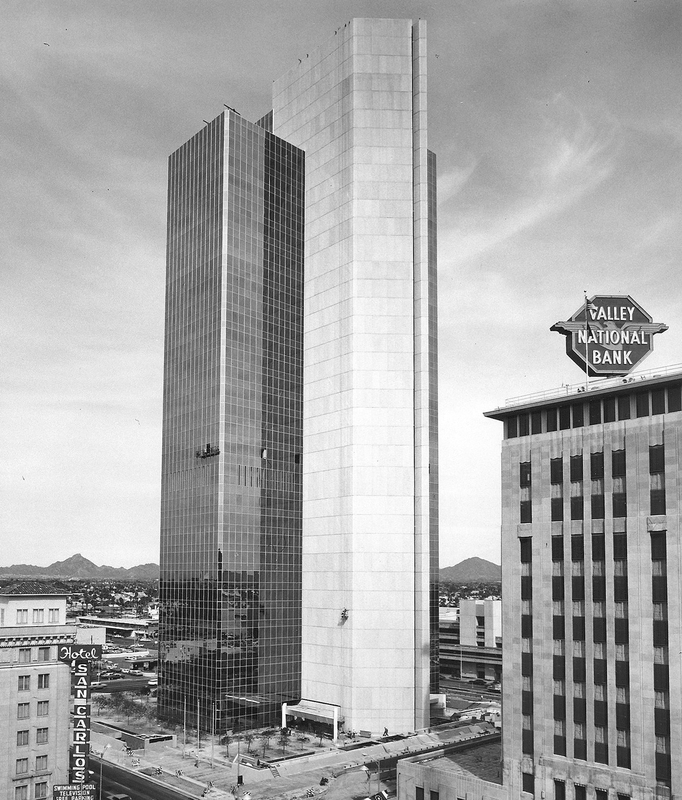 In 1973, the tallest building in Arizona, Valley Center, was built as the new headquarters for Valley National Bank. By then, Arizona and Valley National Bank were one and the same. 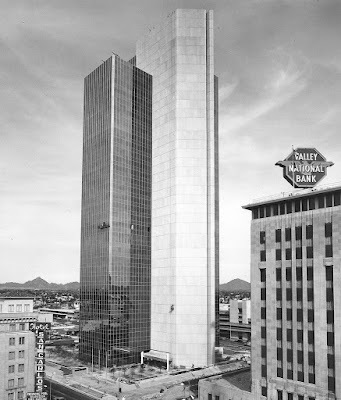 The building was never called "Valley Bank Center" and it never had a Valley Bank logo on it. The size and the design of the building said everything that it needed to say. And all traces of the old Valley Bank headquarters, in the old Professional Building, were taken away. 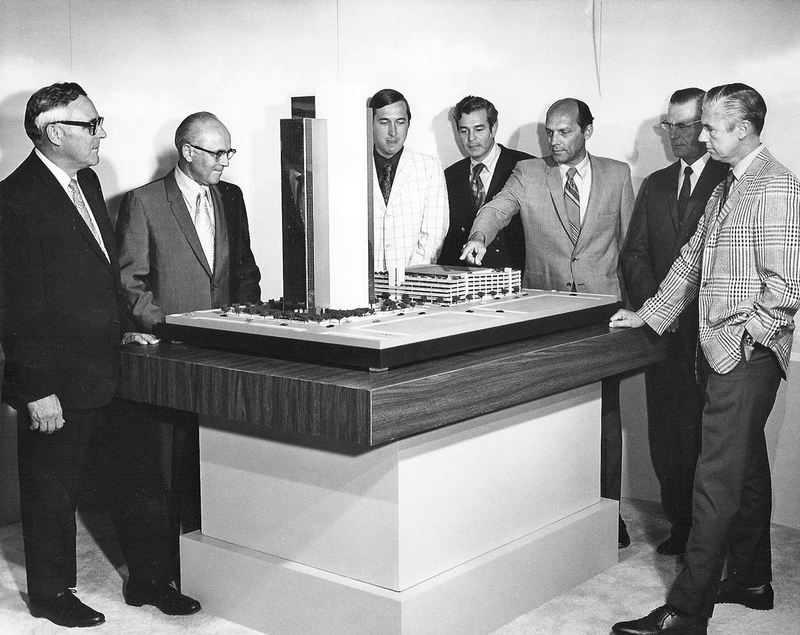 Valley National Bank executives inspecting the model for the new Valley Center building in the 1960s. President Earl Bimson is pointing to the parking garage. Valley Center under construction in 1972, Central and Monroe. Now Chase Tower. 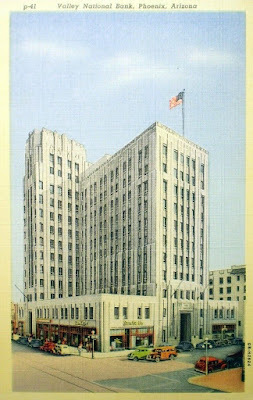 The building at right, the original headquarters, known as the Professional Building, which was built in 1931, was abandoned in 1987 and has remained empty and boarded up since then. Phoenix, and Arizona, was built by people who have had a progressive attitude. And unfortunately, their forward thinking has often left the past behind, to be thrown away. Nowadays, people in Phoenix want to live in a city that looks forward and also respects the past. Thanks for the update because walking past the building on Central this morning I wondered what was going to happen to the building. To see all the renovations to that old building kinda makes me happy that we are preserving something from our past.